I need to know if someone knows of a series that has a decent height to it. I want to do some stop motion or photcomic etc, and I'd like to incorporate my shinkis, just not have them as amazon women.. ya know? I know the alternator line is a decent height from other comics I've seen,...any others? I'm also SERIOUSLY looking for a decent height Soundwave if anyone knows of a decent series..
What do you mean by 'decent height'? As tall as shinkis perhaps? Well, imho, TFPrime's SoundWave is just about right for Shinki. TFAnimated also good, but it's kinda "bulky" instead of "slim & menacing" like the Prime counterpart. Last edited by Storm Wing on Fri Nov 30, 2012 9:42 pm, edited 1 time in total. infinitygundam103 wrote: What do you mean by 'decent height'? Sorry, I should have specified.. I mean something that would be slightly taller than a shinki. I have a few that are... a hair shorter than the Juvisy and they aren't really that impressive visually together..
And Storm, as much as I like the Prime version of Soundwave, I'm kinda partial to the G1/ WFC or FOC design actually. I know they are just releasing a Master Piece version, and it looks AAAAAAWWWWWWWEEEEESSSSSOOOOOOMMMMMEEEEEE,... but a little pricey for me. the Human Alliance line from the TF movies should be perfect for you, as should any Leader Class things. Voyager-class things are (usually) also okay. MrHolister wrote: Storm, as much as I like the Prime version of Soundwave, I'm kinda partial to the G1/ WFC or FOC design actually. I know they are just releasing a Master Piece version, and it looks AAAAAAWWWWWWWEEEEESSSSSOOOOOOMMMMMEEEEEE,... but a little pricey for me. 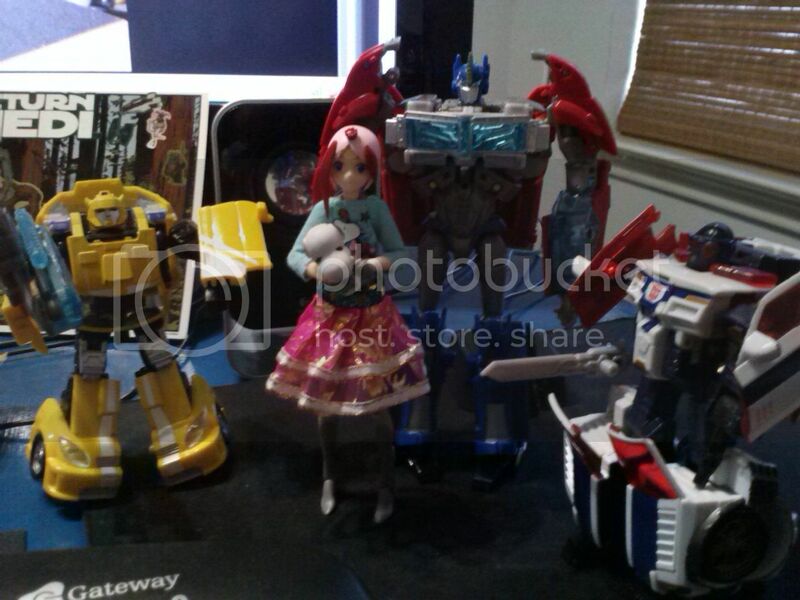 Xehn wrote: the Human Alliance line from the TF movies should be perfect for you, as should any Leader Class things. Voyager-class things are (usually) also okay. 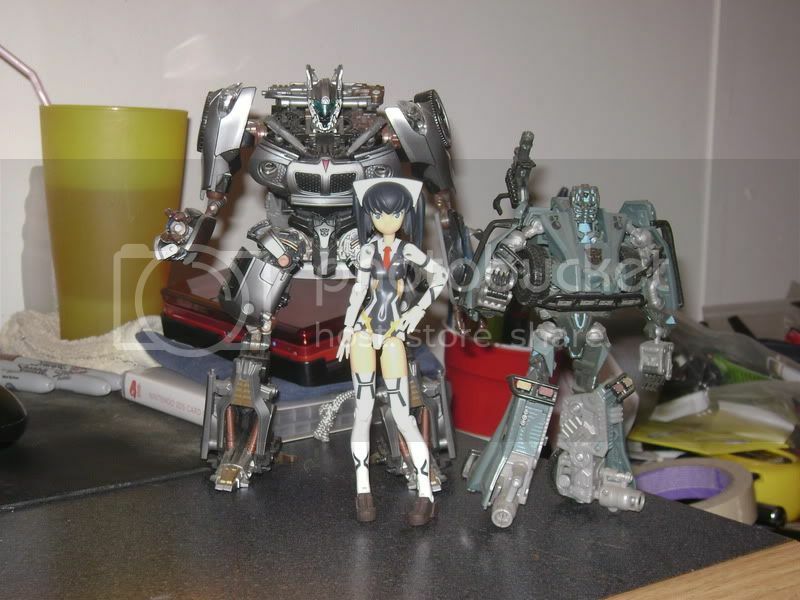 here's a shot of some fairly average stuff with a shinki. Human Alliance Jazz and Deluxe Landmine. Shinki won't really 'tower' over TFs unless it's things that are supposed to be short or scout-class things. 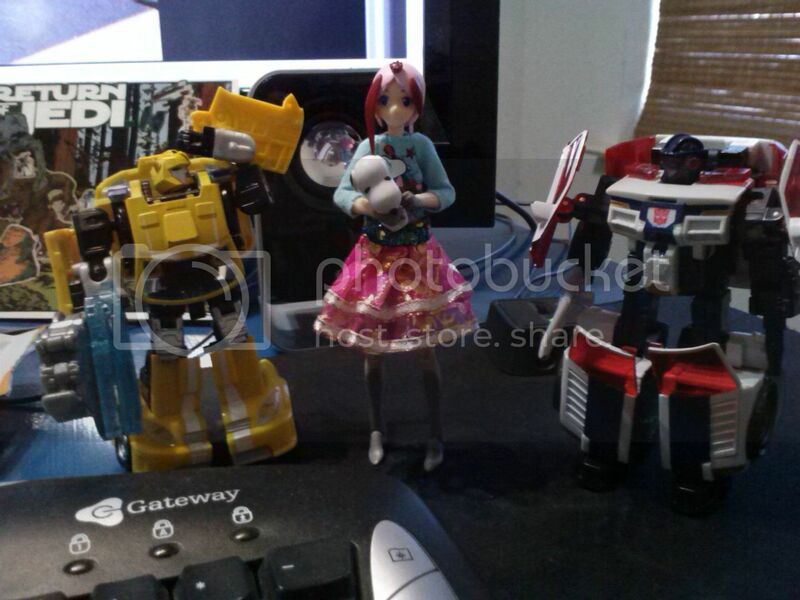 By my shelf, a Busou-less Shinki is just the same size of a Deluxe class Transformers. But With their Busou, mostly just the same size of Voyager class. I'm not in my room right now, maybe i'll try to take a photo or two. But I made a newer purchase for my son today..
Voyager class "Prime" Optimus Prime. He is definitely a better height over all, but I still get that scale issue... He looks perfect with the other autobots,.. ( I hate when Optimus is the "same" size as a guy that would be much smaller in real life,) something that is cool because he is my son's toy. (neat light up gun gimmick too. ) But for what I'm looking for it still seems out of scale,.. not because of height, but his head is teeny tiny compared to hers.. The pic you gave me gives me an excellent point of reference. Thank you. Jazz in that pic is EXACTLY thescale approximately I am looking for. Similar sized head, larger body. Thank you guys very much, you have all been very helpful. BTW, the voyager class Optimus from prime is a pretty decent Transformer for me being out of them for as long as I have been..